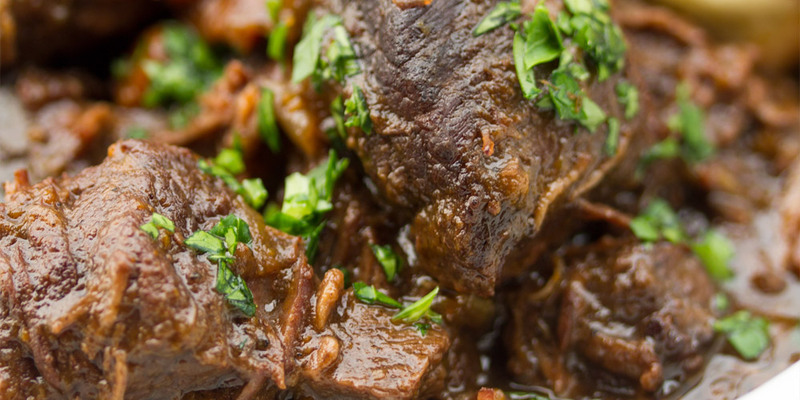 Beef bourguignon is a traditional, hearty French beef & red wine stew. It’s a great way to harness the bold flavor of cheaper (but less tender) leg cuts that can be slow-braised until fork tender. In this recipe we’ve paired the beef with cremini & porcini mushrooms for extra umami & earthiness, then served it with soft, eggy popovers and a savory-sweet honey mustard butter. Delicious! Mash together the mustard butter ingredients in a bowl, then move it to the fridge while you cook the rest of the dish. Rehydrate the porcini mushrooms in 2 cups boiling water (how to rehydrate mushrooms). Strain & reserve the water. Trim any surface membranes & silverskin out of the beef, then cut it into 1”-1 ½” cubes. Season the cubes with 2 tsp of salt and 1 tbsp of black pepper. Sear the beef cubes in a hot, oiled skillet over high heat, until they’re browned on all sides. You’ll likely have to work in two or more batches, so use a portion of the 4 tablespoons of oil for each batch. In between batches of beef, deglaze the pan with half of the wine, pouring the wine from that batch out into your braising pot before adding more oil and the rest of the beef. Once all the beef has been browned, move it to the pot with the wine. Add the carrots, onion, and celery to the pan along with a half tsp of salt. Brown the vegetables, then deglaze the pan with the remainder of the red wine. Add contents of the pan to the braising pot along with the bay leaves, beef stock/bouillon, strained rehydrating liquid and porcinis. Bring the liquid to a boil, then reduce the heat to a simmer, cover the pot, and simmer until the beef becomes fork tender (about 1 ½- 2 hours). Optional: 40 minutes before the beef is done, stir in the pearl onions. Preheat your oven to 450°F with a rack into the middle slot. Butter & flour the muffin, mini muffin, or popover pan. Tap out any excess flour. Once the beef is tender, strain out & reserve all the solids from the pot. Bring the liquid back to a simmer & cook until it has reduced by half. Press the flour into the butter (this is a traditional thickening technique called a beurre manie). Whisk it in to the simmering braising liquid & cook until the liquid thickens. Taste the sauce & add white wine vinegar to taste (plus additional salt if necessary). Stir in the solids. 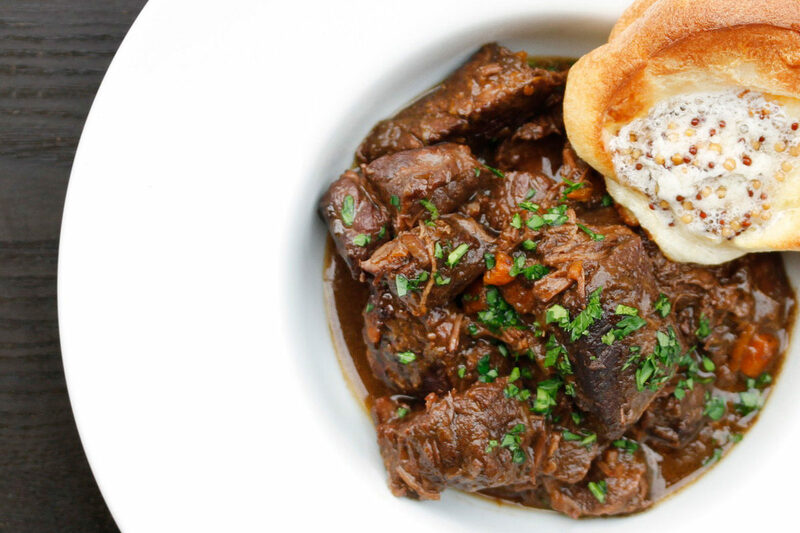 Keep the beef bourguignon warm while you make the popovers. Melt the tablespoon of butter in the microwave. In a bowl lightly beat the eggs, when whisk in the milk, melted butter, and salt. Put the flour in a separate, large bowl, then gently mix the egg & milk mixture into it, just until there are no longer lumps. Fill each cup of the pan 3/4ths of the way full with popover batter. Move the pan to the oven & bake for 15 minutes if using a mini muffin pan, 25 minutes if using a full size muffin or popover pan. After the appropriate baking time, turn the oven off, but leave the popovers inside for an additional 5 minutes (mini) or 10 minutes (full size). Remove the pan from the oven, the popovers from the pan, and immediately serve them with the beef bourguignon & honey-mustard butter.